Award shows can blow our minds or be a snooze-fest, but the Grammy Awards are known to put on a real show. The music’s flowing, outrageous fashion is everywhere you turn and legendary industry vets share the stage with stars on the rise. As far as best 2019 Grammys moments go, there were a few standout performances and speeches and a heartwarming reunion that won the evening. We don’t know about you, but we’re going to need a solid day or two to recover from all of the fun we watched happen on the Grammys stage on Sunday night. Here are the biggest moments that made the biggest night in music even better. The Grammys opening number started with Grammy nominee Camila Cabello performing her hit song “Havana,” but it got even better when Ricky Martin joined her onstage to close out the number with lots of flare. The performance was electric, the crowd was loving it and it was truly the perfect way to start off the big night. The first hour of the Grammys had barely kicked off when former first lady Michelle Obama made a surprise appearance, taking the stage with Lady Gaga, Jada Pinkett Smith and Jennifer Lopez to share with the crowd why music is so important to her. Naturally, she got a standing ovation. After winning the first televised award of the evening, best pop duo/group performance for “Shallow” from A Star Is Born, Lady Gaga shared an important message (which you can watch above) about the importance of mental health awareness, an issue at the center of A Star Is Born. Later in the evening, Gaga blew us all away with a performance of “Shallow” that was as energetic and intense as you’d expect from Mother Monster. Even though we’ve heard the song nonstop since September, this time around was better than we could have hoped for. It felt like 2004 all over again when Keys shared a story of how Grammy winner John Mayer split up his Grammy for song of the year (thanks to his song “Daughters”). The story ended with a surprise as Mayer walked out on stage to show proof that he’d broken up the award and written Keys’ name on the statuette to honor her, too. Katy Perry, Kacey Musgraves, Little Big Town and Miley Cyrus took to the stage to honor the great Dolly Parton and brought the house down, reminding us just how many powerful hits Parton has given us over the years. Did you really think that Cardi B would deliver a snooze of a performance? Heck to the no, people! Cardi absolutely killed it with a stunning, sleek and sultry performance of her 2018 hit “Money.” Cardi was also visibly stunned (and more nervous than we’ve ever seen her) later in the night, when she picked up the coveted award for best rap album. She then went on to give an emotional speech full of gratitude for her team, supporters and her daughter, Kulture. 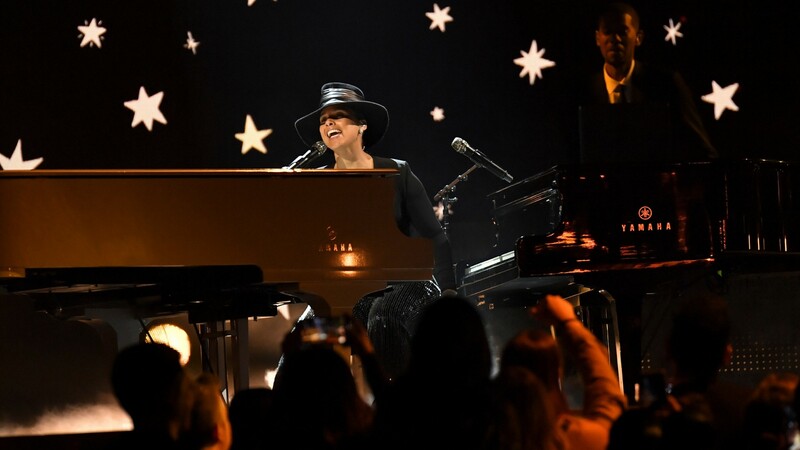 Keys fulfilled a lifelong dream of playing two pianos onstage while performing a medley of songs, including her hit song “Empire State of Mind,” and yes, we’d love to see more double piano performances from her ASAP. Where can we get entrance to #ClubKeys? The host did not disappoint. Ahead of her special performance in honor of her more than 50-year career and her 75th birthday, Diana Ross was introduced by her grandson, Raif Henok. Henok took the stage with ease, charming the heck out of the crowd by making a little joke about being introduced as “little man” and giving some love to his legendary grandmother. We couldn’t handle the cuteness! The 2019 Grammys was one for the books. Hopefully you had some favorite moments, too.